Before the review starts: I have pictures of a few food items but not of all, sometimes I forgot my camera, and sometimes I wasn’t comfortable with taking pictures where we were. Also I will probably repeat a lot of the same descriptive words over and over, sorry about that. This turned out to be much longer than I expected. The wife and I took an extended Labor Day weekend and went to Tulsa to visit some of our good friends. My main goal for the trip, other than seeing my friends, was to eat good food. Since my friends are long time residents of the Tulsa area they were able to deliver the goods. We did not do a lot of “fine dining” but we did eat a lot of food, ok I ate absurd amounts of food, others maintained their dignity. The first stop of the trip was the infamous White River Fish Market. You can find a few food blogs out there who have covered this spot, as well as an article in Gourmet about six months ago. 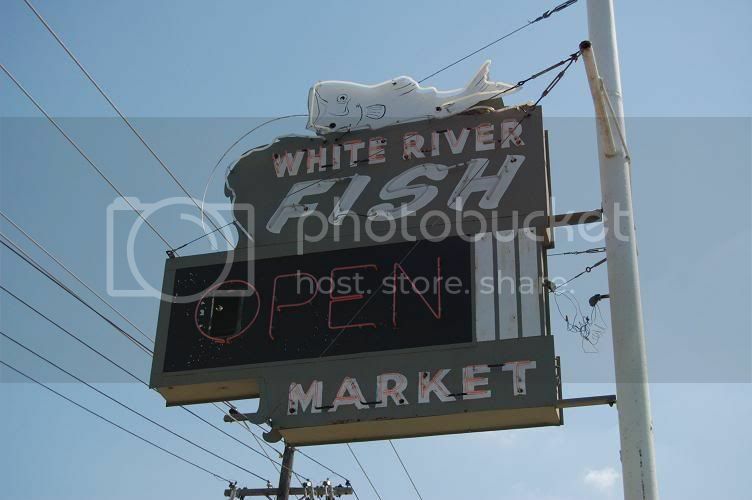 I demanded we go straight from the airport to White River or White Trash Fish Market as my friends lovingly call it. This place did not disappoint. I ordered the broiled orange roughy and shrimp platter along with a cup of gumbo. For sides I had French fries and coleslaw, along with the included hushpuppies. 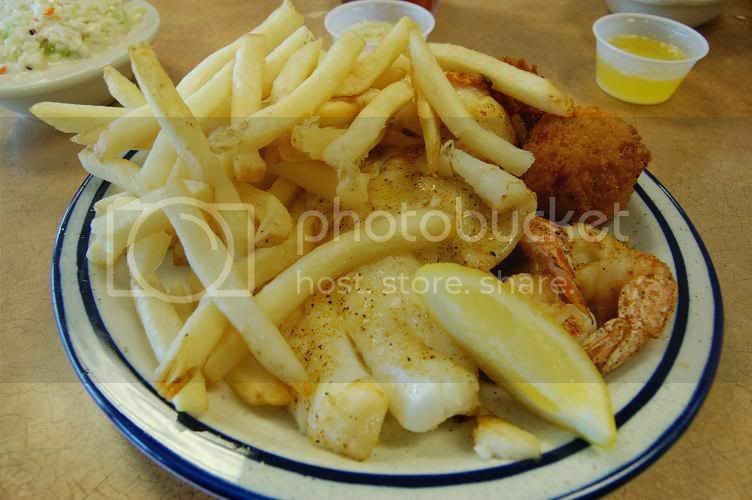 The shrimp and roughy were cooked perfectly and their seasoning was delicious. The hushpuppies were incredible, crunchy and delicious. I thought the gumbo was only decent, not great or good. After I cleared my plate I started stabbing at the plates of others. My wife ordered the broiled scallop platter and I was stunned at the portion size. Seven or eight very large scallops that were possibly the best I have ever had. The onion rings I sampled were delicious and my buddies stuffed crab tasted like great Thanksgiving stuffing but with crab in it. The food was so good that I insisted I be taken back before I left. This time I got the fried catfish and shrimp platter with some potato salad and coleslaw again. The potato salad was good, as was the catfish and shrimp platter, but I preferred the broiled platter I had a few days earlier. If you go, do not miss the buttermilk pie. I had three slices in two trips, it was perfect. The service at White River was also amazing, you order at the counter and somehow, without asking questions the wait staff magically brings you your food, without running around the restaurant asking “Who ordered this?” If I lived in Tulsa I would eat here all the time, I want to go back right now; I’m starving just thinking about it. For dinner on our first night we went to the favorite Mexican restaurant of my friends, El Rio Verde. I thoroughly enjoyed my meal at this place also. The chips and salsa were great, the salsa had a spice/flavor to it that I just couldn’t put my finger on but it was good. On the recommendation of my friend I ordered their signature “smothered burrito. It is a huge burrito covered in sauce, cheese, sour cream and guacamole, I had mine filled with carne asada steak. It was a great burrito, the sauce was excellent. Their homemade guacamole was also delicious. To go along with my burrito I just had to try a taco because they offered beef tongue as one of their standard meat choices. This was my first time eating tongue and it was not a disappointment. The tongue was tender, and tasted like an extra flavorful Mexican spiced roast beef. My wife was still full from her lunch so she ordered a single cheese enchilada. It was sprinkled with parmesan cheese which I found odd, but tasted good when I ate it. It had lots of cheese with a nice red sauce, a good little enchilada. I did not get dessert here because of the two pieces of pie I had consumed earlier in the day. I was seriously full after these two meals. The service here was fine, and the décor was what you would expect for a hole-in-the-wall Mexican restaurant. The next day we at lunch at a new restaurant called Local Table. This restaurant sources almost everything they offer locally. I’m not sure of the percentage, it’s not 100, but the goal is as much as possible. Local Table has a trendy/hip look inside and the wait staff is in black t-shirts and jeans, casual but hip. The menu was diverse and did not focus on any one style of food. I ordered a pulled BBQ chicken sandwich topped with their “Napa Valley Slaw” and served with fries. The sandwich was good, although the pulled chicken was all white meat which I found a bit disappointing, I’m sure the flavor could have been better with some dark meat in there. The slaw was good, and so were the fries. My wife ordered a chicken and bread salad dish which was obviously a riff on the Zuni Café Classic. The chicken was nicely oven roasted and had good flavor. The salad dressing was creamier than the one you will find at Zuni and instead of dried currants (I think that’s what they have at Zuni) they had these incredible dried cherries in the salad. I was eating them off of my wife’s plate like a fiend, they were sweet and delicious. On the whole it was a good little dish for ¼ of the cost of the Zuni original, but you also don’t get the whole chicken. We had no dessert here, but their homemade bread that you get before your meals was excellent, it was also served with warm butter which is always appreciated. 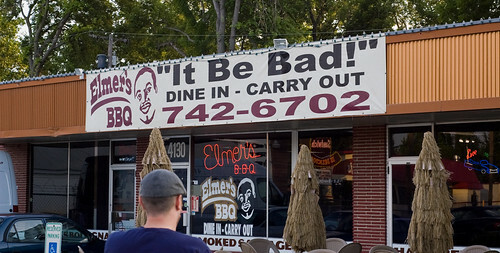 I hope that this place is still open and going strong next time I get back to Tulsa. I’m wondering how their menu will change to reflect the rotating seasons. After those three in a row I am somewhat unsure of the order in which we ate at the following places. One afternoon we stopped at Steven Howard’s Kokoa. This little place is a high end chocolate and dessert shop. Apparently they also serve dinners sometimes, but we did not go for that. We ordered three chocolates from the display case, an espresso type, a cashew and caramel type and a champagne type. All dark chocolate based and all of them were exceptional. 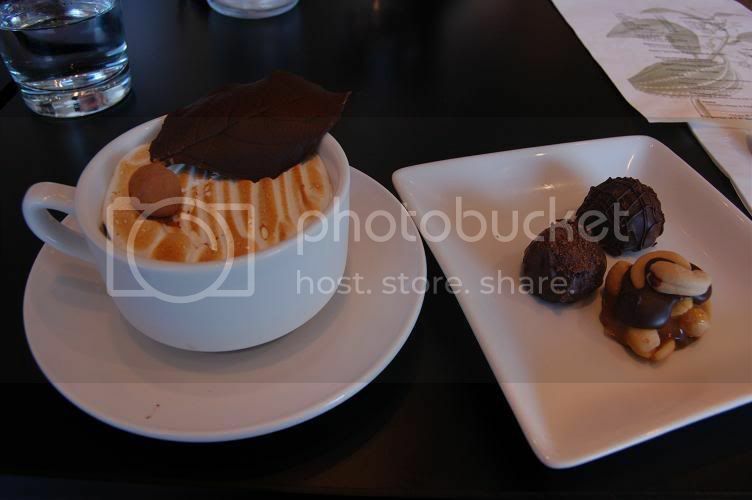 To go along with that we ordered their Chocolate Pot De Crème. The pot de crème was beautiful to look at, as were the chocolates, and tasted incredible. The marshmallow toping was nicely baked browned and the chocolate underneath was rich, creamy and flavorful. These treats were easily some of the best chocolates I have ever tasted, a “can’t miss” for chocolate fans. For dinner one night we went to one of the two good Thai restaurants that exist in Tulsa, according to my friends. We went to Lanna Thai (midtown location) and ordered up a good amount of food. For appetizers we ordered the ground pork dumplings and chicken satay. Both of them were excellent. The pork dumplings were light and delicious and the chicken satay might have been the best I’ve ever had, however I don’t have an extensive history of eating Thai. The satay sauce was creamy and full of peanut flavor. The chicken satay also came with a fresh little salad of cucumber, red onion and a vinegar sauce which I could have eaten a large bowl of. For main dishes we ordered up four of them and shared with each other. I ordered a shrimp dish with fried rice and a fried egg on top where you pour chicken broth onto the dish at the table. I ordered it spicy, it had some ok heat, but was not as hot as I would have liked. We also ordered a red curry dish, a pad Thai dish and a chicken dish that I can’t really remember as it was the worst of the bunch. The red curry was soup like coconut sauce with chicken in it, it was tasty. The Pad Thai was excellent and full of flavor. For dessert I ordered bananas fried in won-ton wrappers served with honey and powdered sugar, they were delightful. I wish I could remember some more details from this meal, but this whole post is from memory, I need to start writing things down. I think that it is it for meals at real “restaurants” as we had a cookout with my friends family one day and grilled steaks another night at my friends new house. However I did do some other eating out. In Wisconsin we do not have Sonic, and I had been to Sonic the last time I was in Tulsa and wanted to go back. 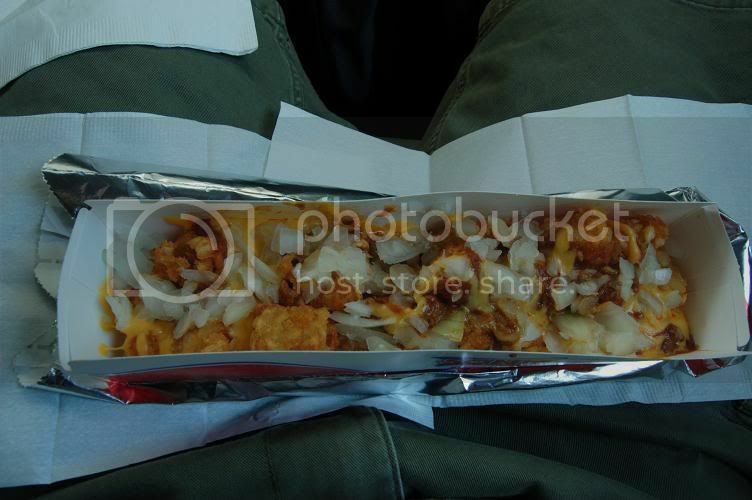 Sonic has chili cheese tater tots, and these are a junk food straight from the hand of god. They are not a culinary masterpiece and I could understand people being repulsed by them, but I love them. I ordered the Sonic size and don’t regret a single bite. The burger and shake were ok, whatever, next time I’m just getting two orders of the tater tots. Also in the realm of fast food, my buddy was hungry and wanted a snack so we stopped by Taco Bueno, also not in Wisconsin. I couldn’t resist trying the deep fried cheesecake chimichangas. These things were also a really good junk food; I probably could have eaten two or three orders. 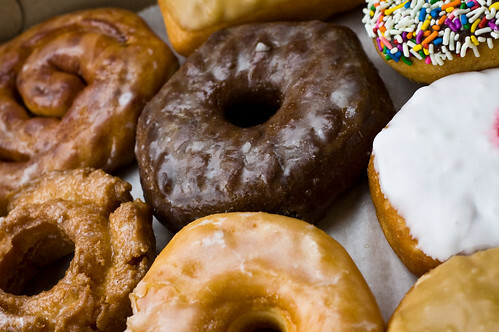 Daylight Donuts is, as Tulsa based Donut chain that has 900 retail outlets. We could not locate an independently owned donut shop, so I settled for Daylight Donuts. 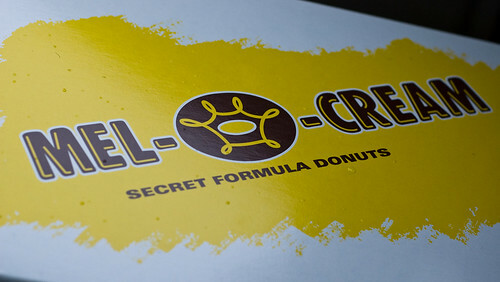 They make a fine little donut; I ate four or five of them one morning and enjoyed them all. Bavarian cream filled and devils food cake were my favorite. Quick Trip gas stations also have one of my favorite treats for when I am in the Tulsa area, the Quick Shake. Chocolate is my flavor of choice. It’s not that they are great or anything (they are enjoyable), I just kind of like to use the little machine that stirs it up for you, and they are cheap. Now back on track to some people and places that are trying to do respectable things with food. While at the farmers market near my friends house we picked up a loaf of Farrell Family Organic Bread. I picked out the jalapeno, corn, and cheddar cheese bread. The guy selling suggested eating it with BBQ chicken, but I just ate it plain, and toasted. This bread was awesome. You can pick it up at a quite a few locations in the Tulsa area and it makes really good “snacking” bread. I’m sure the other varieties they make are just as good. Center 1 Market. While we did not buy anything at this place, we did stop in to look around. It is a grocery store that is selling all local produce and meats. 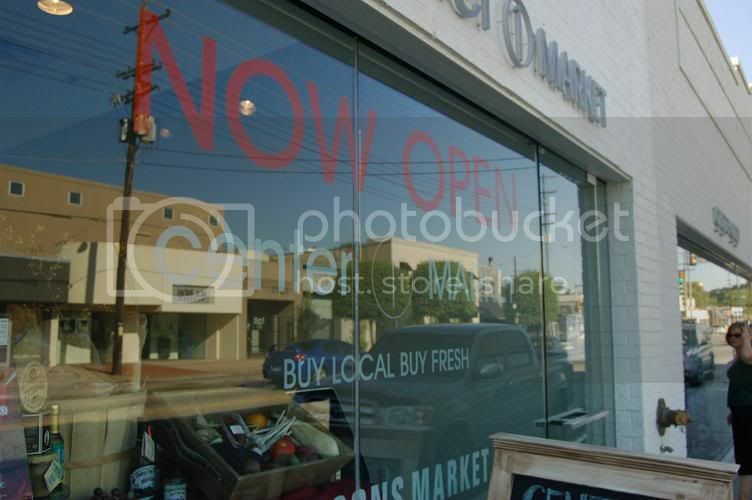 Kind of like a farmers market that is open everyday, it does feel kind of upscale though. They were handing out samples of cashew brittle that was pretty amazing. 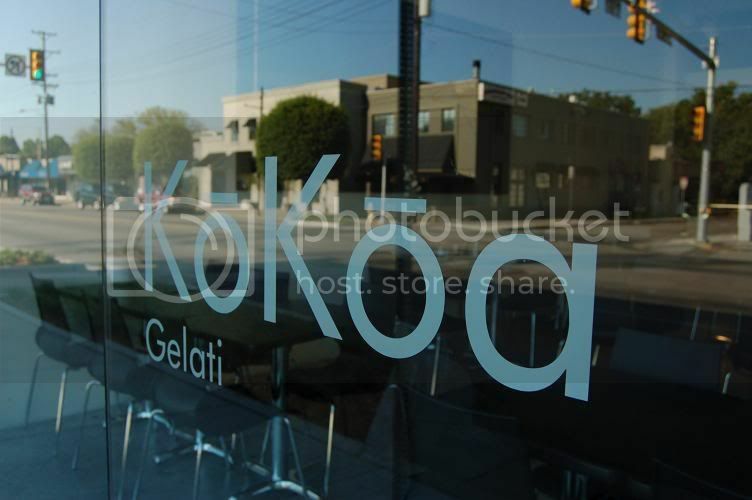 I would have tried more samples around the store but we had just finished up at Kokoa and I was stuffed. They had some huge ribeyes that were still attached to the huge rib bones, they looked really good. They sell Farrell Family Organic breads too. Along with offering these local foods to the public, restaurants in the same building (fancy strip mall?) will be purchasing ingredients from them so they can offer some local fare (Local Table is a few blocks down, from here also). Last edited by brandon_w on June 29th, 2009, 8:12 am, edited 1 time in total. Glad that you enjoyed your visit to our fair city. I do shop at the Center 1 Market because it brings a couple of places that I shop at in one place, Bodeans fish market and Farrell Family Breads. My mom is from Tulsa, and I spent many days there when I was but a wee one. I have great memories of Coney I-Lander and their tiny hot dogs laden with chili and mustard. You may want to check it out next time you're there. Don't forget the Pepcid. I see there are no shortage of junk food aficionados on this board, so I decided to join in. I saw the Coney hot dog places, next time I am out there I will have to stop and get one. 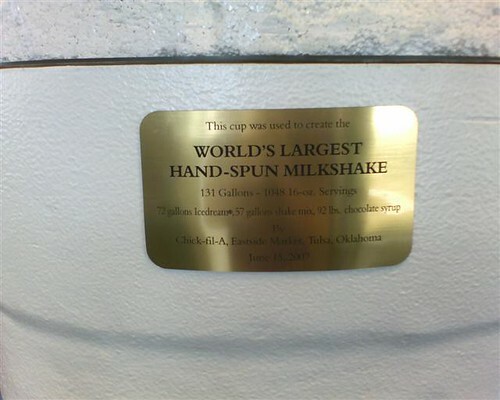 On Thursday I discovered that the Chick-fil-a by the Woodland Hills Mall on E 71st St is the home of the world's largest hand-spun milkshake. I am sorry, I have lived here almost 7 years and still don't get the coney dogs. I love hot dogs, but these are more bread than anything else. I guess you just had to grow up here to understand them. I have tasted them and just not my thing I guess. They remind me of Royal Castles or Krystals burgers. I will have to go back to Grumpy's Dogs and pass on the coney's. Another trip to Tulsa this year, by road this time. On the way down I stopped in Springfield, IL for breakfast. You can read more about that in the Springfield thread, but I have put the pictures in here too. My only other food stops on the drive happened in St. Robert's, MO. Not because of any sort of food destination but to see some friends of mine who are in the Army and were told to be there. So no pictures or info about any food from there. While in Tulsa I did a good amount of eating out. Some of it good, some of it not so much. 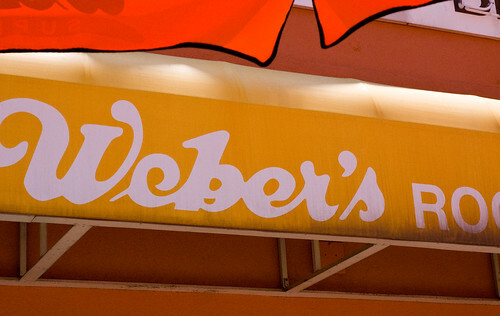 First up is Weber's, which has been around Tulsa for over 70 years. 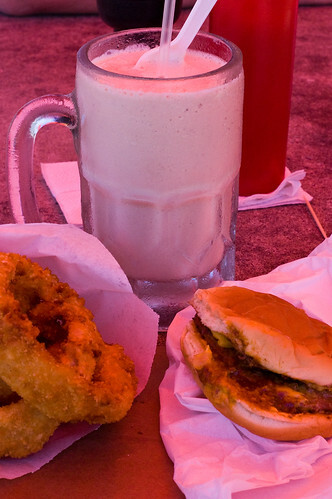 They are a rootbeer and burger stand with good food. They brew their own rootbeer and make delicious rootbeer freezes with it. The rootbeer freeze might be my favorite thing I had while in Tulsa. Food is cooked to order so if it is busy, it does take awhile. 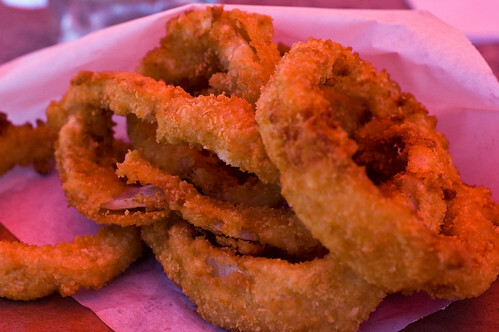 Their onion rings are hand cut and dipped on site and I thought they were very good. My burger was the chili-cheeseburger and it was ok. Maybe a double of the meat would of helped it out a bit, however the order of onion rings was huge and I did not leave hungry. The pictures are a bit orange because we were under an orange umbrella. One evening we hit up Elmer's BBQ for the Badwich. It is a sandwich with smoked baloney, brisket, and a smoked hot link. 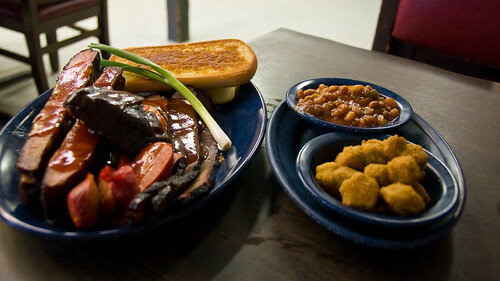 It comes with a side of two ribs, texas toast and two sides of your choice (I got beans and coleslaw). This is a huge meal for $9. I really enjoyed the sandwich. I thought all of the meats were good and their hot BBQ sauce was excellent on it. The ribs were not meat jello but pulled off the bone nicely. We went a bit later at night so they were a bit dry, I'm guessing they had been on "keep warm" for awhile. The other sides were ok, but nothing great. I am kind of regretting not getting a second badwich while I was down there, but I don't think my heart is angry at me. 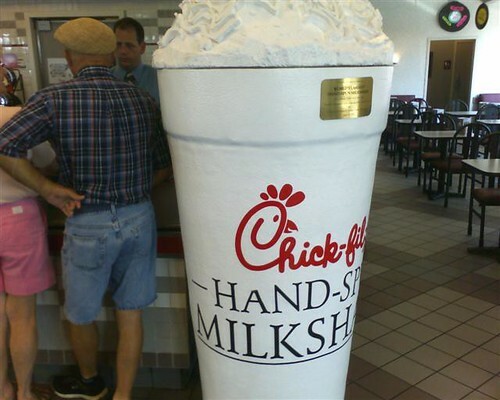 Great sweet tea here, love the sweet tea in the south. 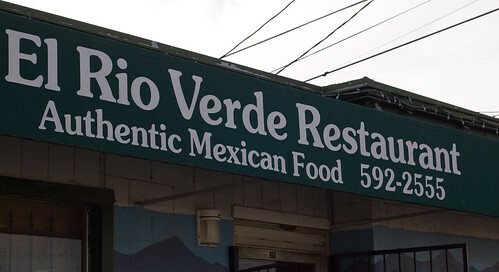 El Rio Verde is a place that I have been to each time I go to Tulsa. 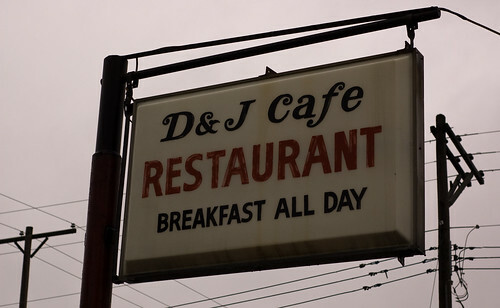 Great food, good prices and the same friendly people have been running it every time. This time I had a Mexican sandwich stuffed with pork and drowned in spicy salsa. I can't remember the exact name of it (torta something), but it was huge and tasted great. The salsa had enough heat to get you sweating a bit but was not overwhelming, the pork on the inside was tender. 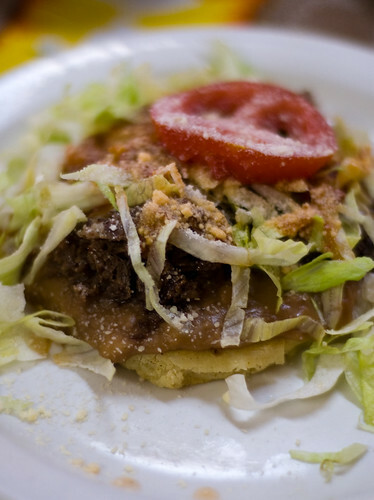 As a side I had a beef cheek sope. A nice bit of refried beans on there, tender beef, very good. 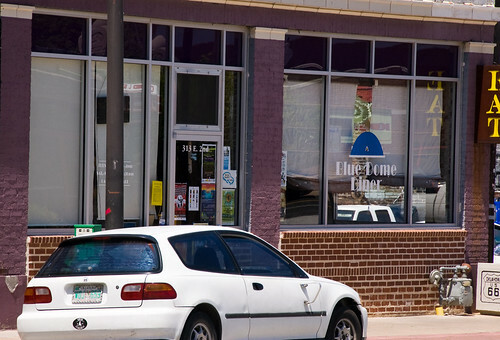 Possibly the healthiest place we went out to eat was the Blue Dome Diner. They do not fry any foods in house, not even fries, they do serve chips though. Open for only breakfast and lunch we arrived half an hour before closing and they were out of a few things for the day. 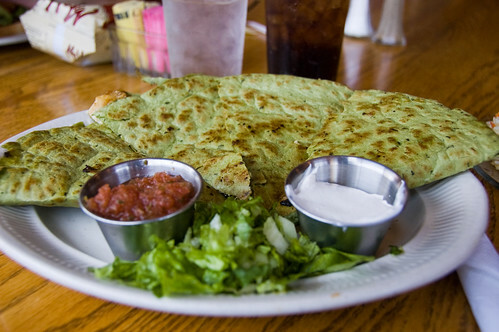 I ended up getting the chicken quesadilla special with a side of rice and beans. The quesadilla was loaded with cheese, chicken, peppers, and onions along with a bit of hot sauce in there I am pretty sure. 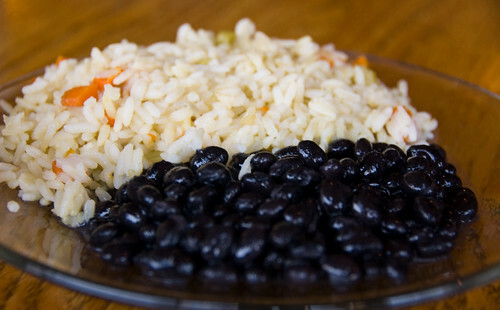 It was flavorful and filling, the rice and beans were also good. 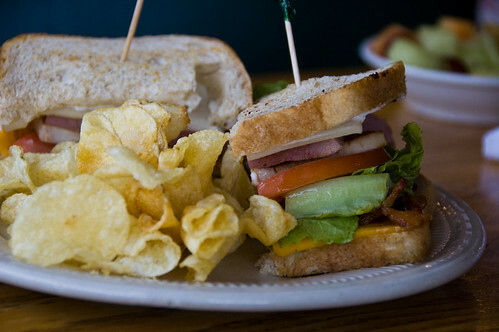 My friend had the Blue Dome club sandwich, which looked fantastic. Thick sliced ham and turkey, big strips of bacon and two types of cheese. Served with chips and a fruit salad. One day we took a trip up to Bartelsville, OK because well we needed something to do. 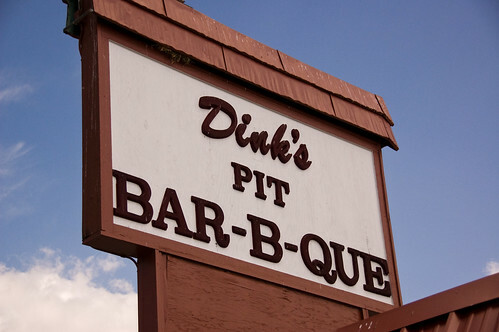 Our food stop was Dink's Pit BBQ. I opted for the sampler platter which included ribs, sliced brisket, sliced pork shoulder and hot links. All of it was very ok. 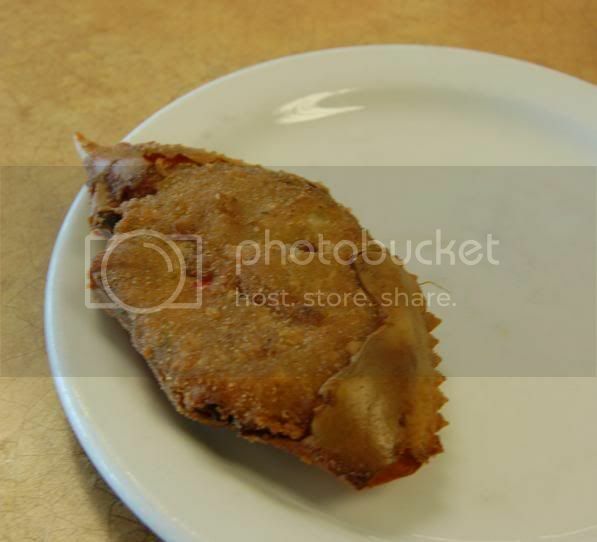 Nothing great about the food at Dink's. The sides were nice, I enjoy being able to order fried Okra when I see it on a menu. The service was good here and the staff was friendly. My biggest complaint was that they slathered a whole lot of their not so great BBQ sauce on my plate before bringing it out. 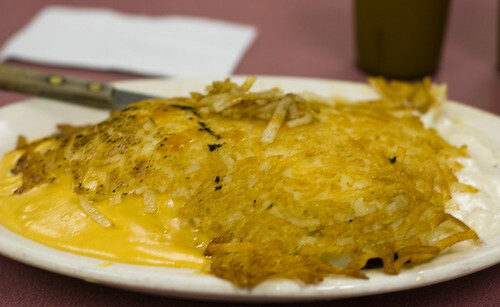 If you ever find yourself in Bartelsville, I wouldn't say don't go to Dink's because I don't think there are a lot of other choices, just tell them to keep the sauce on the side. We took one more road trip while I was out there to the Blue Hole in Salina, OK. It is a fresh water spring type thing that feeds a stream. The water stays 68º in the summer and it is always flowing, so it's a lot like swimming in the cleanest lake ever. A great day or weekend trip, you can camp there. 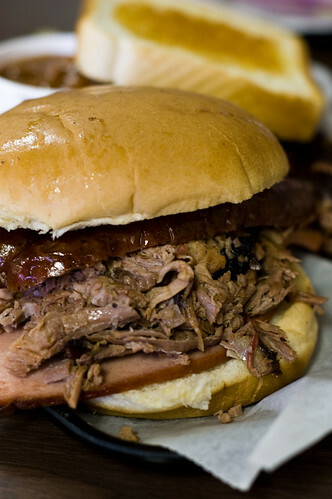 At the edge of town in Salina, there is a distinct edge, there isn't much around Salina, there is a little place called Pig-N-Out. It has a huge menu of cheap eats. We did not eat a full meal there because some people in the group started to complain that they wanted to go eat somewhere, where they could sit inside in the A/C. I did manage to order my first ever Frito Pie, the deluxe version there, which was enormus for about $2.95, and a chocolate shake. Someday I would like to go back to the Pig-N-Out and try more of their stuff. It's complete small town greasy spoon type food but that Frito Pie was memorable, and everything is so cheap. I'd highly recommend the Pig-N-Out if you ever find yourself in Salina, OK.
We left the Pig-N-Out to go to JL's BBQ in Pryor, OK. This is some of the worst food I have ever eaten. 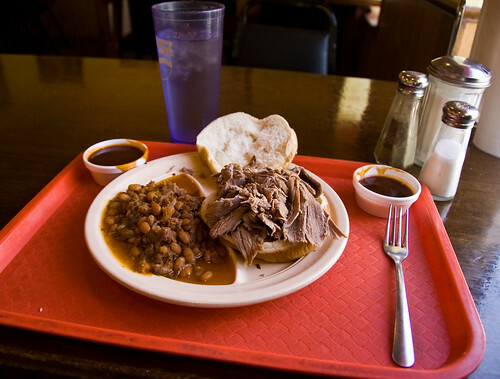 I ordered the brisket sandwich and was given a big pile of gray meat and some soup beans with meat in them. Terrible, lifeless and flavorless. My friend ordered the smoked chicken dinner and said it tasted like it had been smoked on railroad ties, after that description I decided not to try it for myself. Stay far, far away from this place. A lot of people were there and I cannot Imagine why. brandon_w wrote: This time I had a Mexican sandwich stuffed with pork and drowned in spicy salsa. I can't remember the exact name of it (torta something), but it was huge and tasted great. 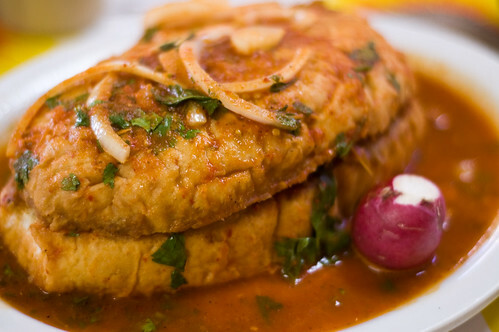 Looks like a torta ahogada. My dad went to Tulsa University and he might have some restaurants to add to your roadtrip. Only problem is he was there in 1953! Thanks for the pictures and reviews. I love these type of threads more than any other. Going on a road trip for food is one of my favorite things to do and I have discovered so many thanks to this board! Unfortunately it looks like your BBQ excursions were not so great. I lived in Tulsa as a small child, and there is one restaurant i remember in particular from those days-Casa Bonita. It was a gigantic (to my five-year-old eyes), rectangular, light-pink Mexican restaurant with a carousel inside! The interior was extravagantly decorated, with several different-themed rooms-think Rainforest cafe, only more cavernous and without the specific 'rainforest' theme. I have a vague memory of sitting with my family in a large, secluded, oval-shaped booth in a recessed space that really felt like a cave. I was young, but it was so fun to go there. The menu was straight Tex-Mex, one of my favorite cuisines when done right. I remember enjoying the food, but again, I was five. The best part wasn't even the carousel, it was the complimentary sopapillas at the end of a meal. The were freshly fried puffs of dough, and there were squeeze bottles of honey on the table to drizzle over them. The tables all had little flag stands, and when you wanted a refill of sopapillas you just raised your flag and a server brought fresh ones. I know i would still loves those if I went back today. Looking online, Casa Bonita has been through a few different incarnations since my childhood, so I couldn't say how similar it still may be. It does seem like they are still known for their sopapillas. Did I mention the atmosphere? Good, it's worth saying a million times because it's that awesome. We walked around a little bit more on the way out, enough to see the waterfall that is now back up and running just like I'm told it was back in the good old days and to see the seating in the cave area. It's amazing how big this place is and how each little area feels like its own small and cozy little restaurant instead of just one huge room like some places. There was a magic show going on periodically in a room near where we were sitting, and there is also an arcade. I didn't explore either of those, but there were some kids looking happy enough about all of it.